The Civic, which debuted in 1973, was the first car introduced by Honda. Before that, the company was better known for its motorcycles. It is known for its roominess and fuel efficiency. Now in its eighth generation, the Civic is respected for its reliability, and the 2018 Honda Civic ranked #3 in Compact Cars in U.S. News & World Report. Drivers benefit from reliable braking and steering and an efficient engine. The car’s reputation for fuel efficiency is improved upon with the latest hybrid’s 50 mpg city/highway. Its cabin is well-equipped and accentuated by high-end materials throughout, so it makes sense to invest in the highest quality rubber of carpet floor mats. Lloyd Mats Store can provide you with custom floor mats to fit the style and aesthetic of your car with mats that proudly display the logo of your Honda Civic. No matter the color or interior of your car, you can get a perfectly fitted mat or truck liner that perfectly fits with your vehicle. Classic: You and your Honda Civic are going to go on plenty of adventures, so the classic loop Honda Civic Floor mats were created with polypropylene yarn. These automotive mats are dirt and grime resistant, and they are easy to clean. Choose from a variety of colors and stitchings, and pick a floor mat as bold as your Honda Civic. Ultimate: These floor mats are built from a two-ply nylon set, which makes them durable and long lasting. These are custom floor mats that you can rely on, and they are as dirt resistant as our classic loops. These Honda Civic floor mats are also highly customizable. Check out the product above. Velourtex: With nylon yarn and TractionBac™ , these floor mats have a high-quality heavier feel and they are guaranteed to be non-slip. Just like all our other floor mats, you can order them with a Honda Civic emblem, unique colors, and custom stitching. Luxe: Made of soil/stain resistant carpet material, Luxe mats are cushioned with a waterproof urethane core and multi-layer backing, so the mat won’t crease or slip. It even insulates against heat and road noise. The crush-resistant yarn does not unravel, and it is available in 10 colors. Berber 2: Made by Lloyd, Berber 2 mats feature modern materials that add durability and style. These carpet floor mats are made of premium nylon yarn and have a non-skid rubber backing that resists moisture. Also, their commingled flecked yarn colors hide dirt and soiling, so the material retains its appeal over the long term. Whether you need Honda Civic vinyl floor mats or premium carpet floor mats, Lloyd Mats Store is here for you. We’ve been manufacturing custom fit floor mats for all makes and models of automobiles since 1978. Purchase from our store or other automotive accessory retailers, or contact us at customerservice@lloydmats.com today. We stock a variety of All-Weather Floor Mats for the Honda Civic. Replace your floor mats with durable ones that protect your vehicle against water, road salt, sand, and mud. Our Rubbertite, Northridge, and Protector mats are custom fit for the latest model year vehicles and all early Hondas. They feature a variety of colors and textures to not only protect your ride but enhance its aesthetic appeal. 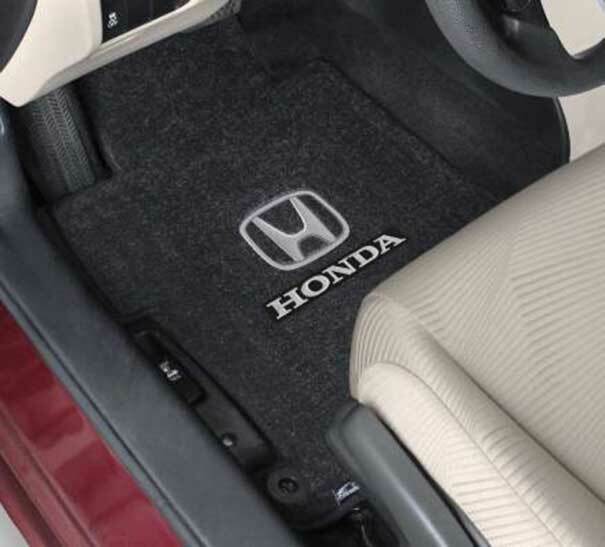 Lloyd Mats supplies premium Honda Civic floor liners. Durable in design, they are perfect for any new car, as they can last for many years under the harshest of conditions. Rubbertite: Each custom fit mat has hundreds of wells, holding enough water, snow, sand, mud, and spills to protect the floor below. Made of durable, heavyweight synthetic rubber, the mats have a non-slip texture for safety and a non-skid backing. Cleaning it is simple; just hose it off with water. Protector: Effective at protecting your Civic against soil, stains, and spills, Protector Mats are made of a heavy-duty clear vinyl material and come in various full-width coverage patterns. They are cleaned with a hose or by wiping, and they dry within minutes.